Over the past decade urbanists, journalists and politicians have hotly debated where Americans were settling and what places were growing the fastest. With the final results in from the 2010 Census, we can now answer those questions, with at least some clarity. Not only does the Census tell us where people are moving, it also gives us clues as to why. It also helps explain where they might continue to go in the years ahead. This information is invaluable to companies that are considering where to expand, or contract, their operations. For Forbes’ evaluation of the Census’ winners and losers, we have focused not on individual cities, but on metropolitan areas, which represent the most accurate designation for measurement. Take Atlanta, No. 10 on our list. While the city’s population grew by 1,000 over the last decade (2010 boundaries), the region, according to the Census grew, by roughly 1 million, the largest numerical increase among the country’s 51 largest metro areas. The city itself represents less than one-tenth the total metro area population. Las Vegas continued to be the nation’s fastest-growing major metropolitan area per capita, adding 41.8% to its population between 2000 and 2010. But the Las Vegas margin was very thin. Raleigh, N.C. (which ranked second) also gained 41.8%, and the difference between the two could only be measured at the third decimal point. If Raleigh had added just 10 more people, it would have been the leader. Overall, some 15 of the big metros grew at more than twice the 9.7% rate experienced by the entire country. One key reason — for at least some cities — was job growth. 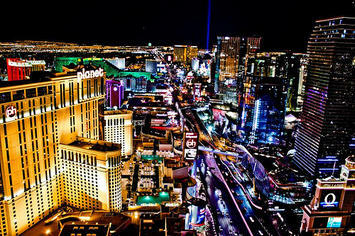 Las Vegas, which added 575,000 residents, and Raleigh grew their economies despite the tough recession. Sin City is still a top flight tourist destination, and its business-friendly policies are still attractive to other industries, particularly from highly regulated California. The Texas metros Austin (No. 3), Houston (No. 8), San Antonio (No. 9 ) and Dallas-Fort Worth (No. 11) all had strong job growth — as did Nashville, Tenn. (No. 12). However, not all the top growing regions in the country share the same economic trajectory. Many of the other leaders grew their job bases rapidly at the beginning of the decade but gave back some of their gains after the collapse of the mortgage market. This happened in places like Las Vegas Riverside-San Bernardino, Calif. (No. 5), Orlando , Fla., (No. 6), Phoenix, Ariz., (No. 7), Jacksonville, Fla. (No.13) and Sacramento, Calif. (No. 14). Yet all of the top ten — with the exception of Atlanta — expanded their job base during the decade. So if job growth itself is not a single determining indicator, what else has swelled these populations? Two things seem to stand out. One major factor seems to be affordability of housing. Throughout the decade people have moved primarily to those areas with cheaper house price relative to incomes. Take the movement of people from expensive coastal California not only to the interior parts of the state but especially to the Texas metropolitan areas, such as Dallas-Fort Worth and Houston. To put this in context, the median house price today as a share of median household income (the “median multiple”) averaged at 2.7 in Dallas-Fort Worth and 2.8 in Houston, compared with 7.2 in the No. 41 ranked Los Angeles or 8.1 in ultra-pricey San Francisco, which ranked No. 37. During the bubble, coastal California housing prices were even higher, peaking at a median multiple over 10, while Dallas-Fort Worth and Houston remained at 3.0 or below. There was also strong migration from coastal California to closer metropolitan areas in the West, where house prices were high by national standards, but far more affordable than in coastal California. Examples of this trend were No. 1 Las Vegas (which averaged 4.0 and peaked at 5.9), No. 7 Phoenix (averaged 3.4 and peaked at 4.7) and No. 15 Denver (averaged 4.1 and peaked at 4.5). A similar phenomenon can be seen on the east coast. To understand the rapid growth of a place like Raleigh, you have to look to the migration of people from the Northeast, notably the No. 44 New York area and No. 43 Boston. Housing costs seem to be a leading factor here. The ratio of median house price to median household income in Raleigh averaged 3.6 (peaked at 4.2) — well below that of its primary talent sources like New York, which averaged 6.3, peaking at 7.7, and Boston, which averaged 5.2 and peaked at 6.1. Among the 20 fastest-growing regions, No. 16 Washington, D.C. region had relatively expensive housing, with an average median multiple of 4.2, after peaking at 5.7. Washington must be regarded in this sense as the great exception, a place whose steady employment growth has defied all market logic, since it is largely tethered to the ever-expanding scope of the federal government and its similarly growing legions of parasitic private corporations. The other major factor determining growth seems to be urban area density and size. Despite all the triumphant celebration of the glories and attraction of dense big city urbanism, almost all the fastest-growing metropolitan areas have low-density core cities and are predominately suburban in form. Indeed not one of the top 15 growing regions has a core city with a density of over 5,000 per square mile and only three, the Dallas-Fort Worth, Houston and Atlanta metropolitan areas, have more than 5 million residents. In contrast, the regions with the densest core cities–such as Boston and San Francisco–all grew at about half or less than the national average, despite core densities of 12,000 or above. All three of America’s largest metropolitan areas–New York, Los Angeles and Chicago, with populations nearing or above 10 million–grew far below the national average. However thrilling and alluring dense large cities might be to pundits, academics and policy wonks, they are proving not so beguiling to Americans who, for the most part, continue to seek out “the American dream” wherever they can best afford it. Yet the very bottom of our list does include cities that are neither expensive nor particularly dense. These include the long-standing declinapolises that actually managed to lose population while the rest of the country was gaining. These include No. 47 Buffalo, N.Y., No. 48 Pittsburgh, Pa., No. 49 Cleveland, Ohio and ever-suffering No. 50 Detroit. The only non-rust belt core city to lose population this decade was No. 51 – New Orleans-Metarie-Kenner, La. Of course, the Big Easy’s decline stems in large part from both nature’s depredations and what appears to be only a limited restoration of its basic infrastructure. But amazingly, the job loss in New Orleans was less than that of perennial loser Detroit and former perennial winner San Jose, which ranked 35th. So in our minds, NOLA’s last place finish may be a bit unfair, but then again so is life — and sometimes demographics. Submitted by Jcottone on Tue, 05/03/2011 - 10:29. I disagree with the conclusion that Americans are somehow repudiating the allure of a dense city because these are growing slower than less dense cities. High density is a result of high land prices, as owners maximize the utility of space. Since high housing costs and high density are both the result of scarce space relative to demand (and low housing costs and density are the result of plentiful space relative to demand) it is flawed to argue that the rapid growth of low density-cities is proof that Americans dislike dense cities, particularly since Mm. Kotkin and Cox already correctly pointed out that areas with relatively low housing costs are growing (relatively) rapidly. Growth is most rapid where there is the most room to grow, and housing density reflects this just as housing prices do. Submitted by C. P. Zilliacus on Sat, 04/16/2011 - 09:07. The private employers doing business with the federal government near Washington are mostly located in Northern Virginia (and in Fairfax County in particular) along the Capital Beltway (I-495) and the Dulles Toll Road (Va. 267) and I-66. Relatively few of them are located near transit stations (though the Dulles Rail Metrorail line will be extended along the Toll Road in the relatively near future). They are commonly known as Beltway Bandits.